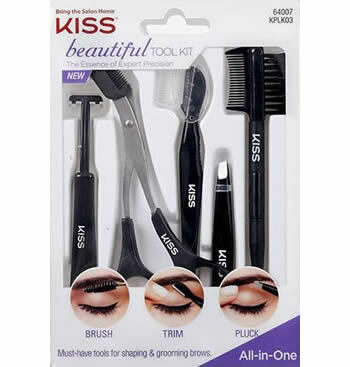 Kiss Beautiful Brow Kit - Precision (KPLK05) creates beautifully defined eyebrows with the Beautiful Brow Kit - Precision. This kit features the ultimate tools to define, outline, fill, and highlight your brows, achieving your desired brow look! It’s everything you need for beautifully tamed, structured, and cleanly-defined eyebrows. The Beautiful Brow Stamp Dark Brown (68141) guarantees you'll never have two different brows again! Just press the brow shaped sponge onto powder and then stamp onto your brow! Cover sparse areas or just create perfect, natural looking brows. The Beautiful Brow Stamp Soft Brown (68140) guarantees you'll never have two different brows again! Just press the brow shaped sponge onto powder and then stamp onto your brow! Cover sparse areas or just create perfect, natural looking brows. The Eyebrow Kit with Stencils is a complete kit for expertly shaping, grooming, and defining your brows. The different pre-cut stencils mimic the most desired brow shapes for all face types. They are easy-to-use and quickly help you shape the perfect brow. Perfectly shaped brows are now at your fingertips! 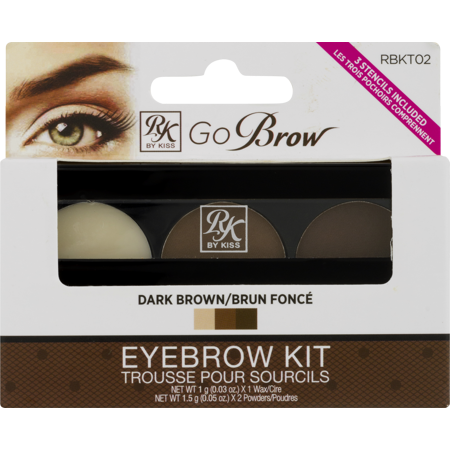 Kiss Go Brow Eyebrow Kit with Stencils - Chocolate Brown (RBKT03) Kit includes: 2 Brow Powders, 1 Wax, Double Sided Brush And Spoolie, 3 Stencils. 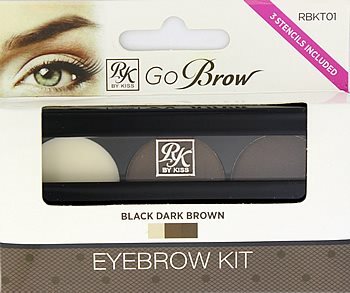 Kiss Go Brow Eyebrow Mascara - Black Dark Brown (RBM01) dramatically transform your brows with the Eyebrow Mascara. With just a few swipes, it sets, tames and tints your eyebrows all at once, making it super-easy to achieve “on-point” brows. It leaves your brows looking soft and natural instantly, giving you more time to show off those killer looks! 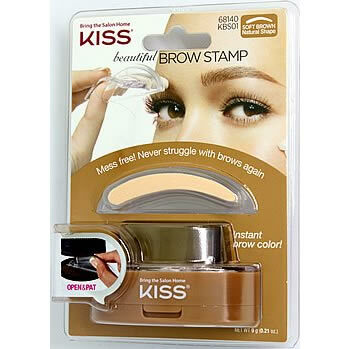 Kiss Go Brow Eyebrow Mascara - Rich Chocolate Brown (RBM03) dramatically transform your brows with the Eyebrow Mascara. With just a few swipes, it sets, tames and tints your eyebrows all at once, making it super-easy to achieve “on-point” brows. It leaves your brows looking soft and natural instantly, giving you more time to show off those killer looks! Kiss Go Brow Eyebrow Mascara - Dark Brown (RBM02) dramatically transform your brows with the Eyebrow Mascara. With just a few swipes, it sets, tames and tints your eyebrows all at once, making it super-easy to achieve “on-point” brows. It leaves your brows looking soft and natural instantly, giving you more time to show off those killer looks! 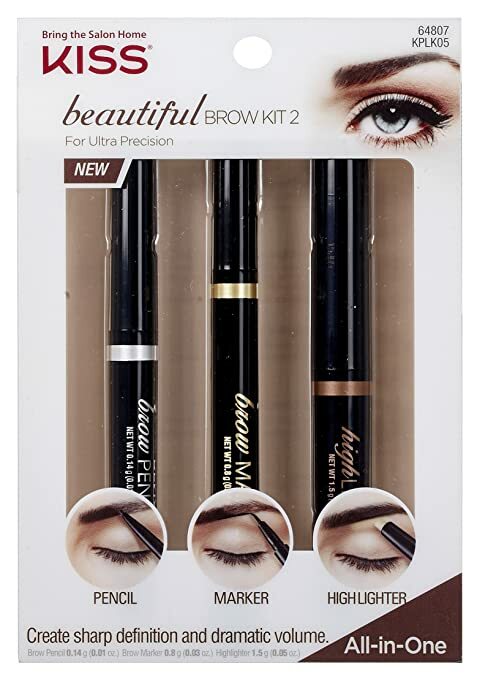 Kiss Go Brow Eyebrow Sculpting Auto Pencil - Black Brown (RBAP01) has innovative triangular-shaped end that’s perfect for shaping both thin and thick brow styles to your desired look. Get bold brows that wow! Create the look of naturally fuller, defined brows with the Eyebrow Sculpting Pencil Black Brown. The darker tint of your well-sculpted brows adds drama for that eye-catching look.